Diverse materials with colorful patterns make the kitchen the loveliest corner of your home. Soft and absorbent, our bath mats are gentle to touch and feel great on the skin while taking a shower. 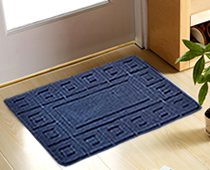 Our beautiful, stylish mats bring a unique style to every room. 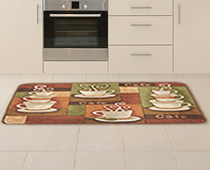 Friction resistant and anti-slip rugs increase safety and add beautifully to entrance aesthetics. Taisho & Co., LTD. was established in 1976 in Taiwan and is a professional manufacturer of mats and rugs. Our production base is in Xiamen, China. We own two factories, covering 3400thousand square meters. Our advanced machines, precise equipment, excellent R&D staff and fantastic designs allow our company to grow sustainably. 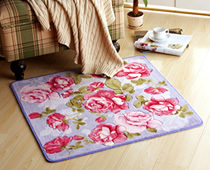 Taisho & Co., LTD. products include door mats, bath mats, kitchen mats, play mats, garden mats, indoor and outdoor mats. Materials used include polyester, acrylic, polypropylene, cotton and more. Innovative techniques and materials are always widely applied to our rugs and carefully recommended to suit our customer’s needs. Alongside customized orders, we further provide all kinds of rugs with beautiful patterns for customers to choose from. Our products are widely available to world markets in America, Europe, Japan, Korea, China, Central and South America and Taiwan.